Home > The Happiness Factor! On the TV show Sunday Morning a while back, there was a segment on the "Happiness Value" of gifts. The idea is that the selling price of a gift should be based on it's value for providing happiness. The "statistic" is that Americans waste $13 billion each year by giving gifts with a lower Happiness Value than the price would justify. In other words, a $100 gift would only provide something like $50 worth of happiness. Admittedly it would be hard to measure something like that, but the idea is fairly clear. That's exactly what we think about all the time. 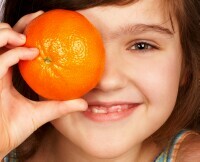 Our Goal is that a gift from The Orange Shop has a Happiness Value greater than the monetary cost! How much happiness can a box of fruit provide? How about multiple rich flavor experiences that will be enjoyed with every bite for about $1.00 an orange in a bushel - less than an order of french fries! Our goal is simple -- we want your expression of love and friendship to be worth more than what you pay! That's our idea of a fair deal, and of what you should be able to expect when you make a purchase.